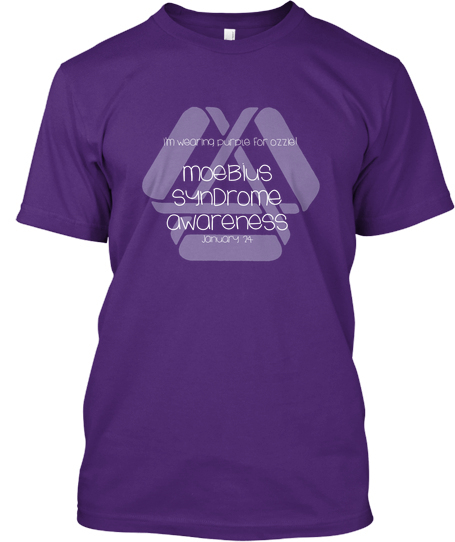 as we begin our fundraising in earnest for the Moebius Syndrome Conference in July of 2014, i was asked if i could have some T-shirts made. I did some research and found a great fundraising website where there is zero upfront cost from us to have the shirts made. 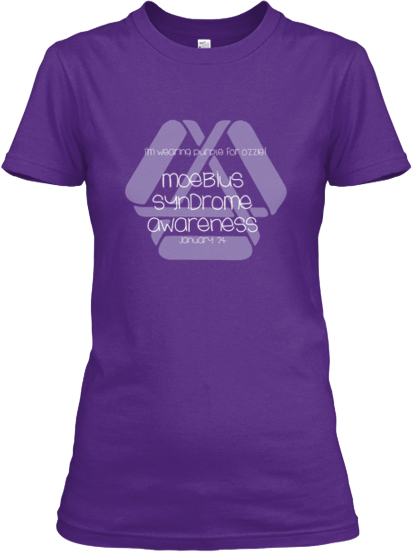 We are selling T-shirts until January 2nd in time for Moebius Syndrome Awareness day on January 24. Now, in the past i’ve asked you to wear purple in support of Ozzie and Moebius Awareness. If you buy one of our shirts, not only are you going to have a snazzy shirt in the proper colour, but you will be doing it for Ozzie!! there are two types of T Shirts, a men’s typical t-shirt, and a ladies relaxed Tee. The prices are $25 US for the mens, $26 US for the ladies, plus shipping costs. Now, the thing about this fundraiser, is that it’s a crowdfunded fundraiser. So, we’ve set a goal to sell 50 shirts, which will raise us just over $700, or almost the price of one airfare to Washington! You can order your shirt by following THIS LINK, or any of the other links on this page. Thank you for all your continuing support!! And regardless of what you wear on January 24, please make it purple! And send us a picture of you in your purple!! This entry was posted in Uncategorized and tagged Moebius Awareness by ozziesmama. Bookmark the permalink.